An Army veteran, Wayne was hired to set up rides but took time to photo his dream house, the Mardi Gras house, at the Okefenokee Fair, in Waycross, Ga.
Wayne’s dream home appeared as the morning fog lifted at the Okefenokee Fair. 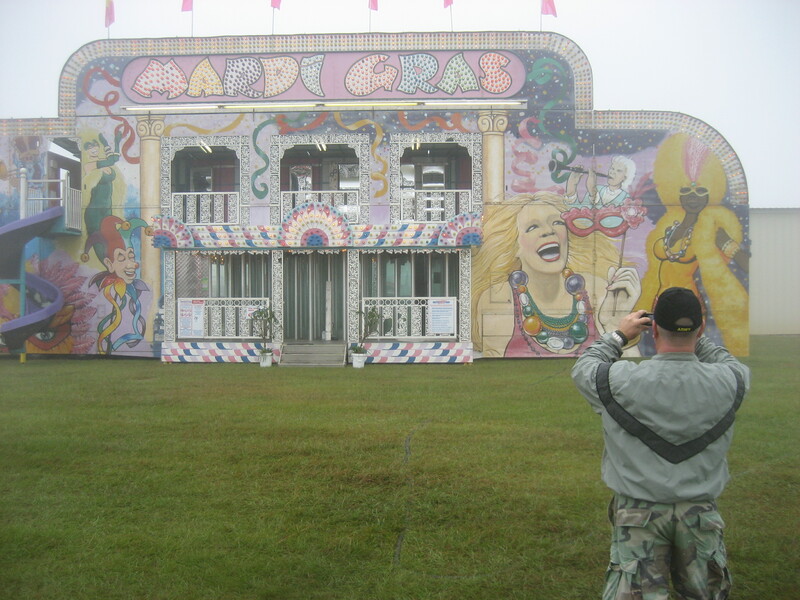 The Iraq/Afghanistan veteran stood grinning and taking pictures of the Mardi Gras house. “Wouldn’t you love to live in a home like that,” he said. When he mentioned that preposterous idea, I got out my camera and took pictures of him taking pictures. Still, he defended his love of the Mardi Gras house and got me thinking of all the places I slept this year in traveling carnivals. The face of the Mardi Gras house is filled with colorful confetti and crazed partiers at a New Orleans-style bacchanalia. On the walls are delirious, overstimulated buxom women and laughing musicians beckoning people inside for wild times. A local hire for set-up, Wayne stopped setting up other rides so he could take picture after picture of his dream castle. Yet the Mardi Gras was a real-life home to two carnies, who lived in the storage rooms in the back. While a Mardi Gras house might look bizarre in a normal neighborhood, in this neighborhood the Mardi Gras house fit. The traveling Mardi Gras ride is a mirror maze on the first floor, with fun-house mirrors on the second floor and an outside swirling exit slide. It struck me, what greater way to stay reminded of life’s fortunes and illusions than waking each day in a house of mirrors, mazes, stairs and slides. “Wouldn’t it be great to have people over in a home like that?” Wayne said. It reminded me that author Tom Wolfe says many of his characters are motivated by the question – what do people think of me? Wayne thought people would think it was fun. Wouldn’t he always be happy in his picture home. I wondered if he thought a happy looking home would internalize the party, the way a kid can feel happier if asked to put on a happy face. Wayne’s Mardi Gras dream home didn’t seem so ridiculous any more. After the fair left town, one of the two carnies living in the Mardi Gras went to live the off-season in Waycross, Ga. He found a girl, her family trailer needed fixing. He could be her fix-it man until the season starts again. The Mardi Gras house was shipped to Lima, Peru, for a winter engagement. “Fall asleep in there and you might wake up in Peru,” the former resident joked. Okefenokee was the last carnival of the year for these carnies and they were scattering to homes across the country. Some were returning to their families. Some would be homeless soon. Some might be headed for jail. Many Mexican carnies headed home to the Mexican state of Veracruz and the carnival feeder town that I visited in October, Tlapacoyan. In line for the final day of pay in Okefenokee, I heard a woman laughing that she didn’t know where she would be the next day. “I had all year to plan, crazy right?” she said squinting, a cigarette hanging from her lips. “Coming back next season?” someone asked. Half that line could have answered in one loud Greek chorus. I had all year to plan too but I still had no place to sleep. In Okefenokee, I slept in an outdoor barn and, later, in a semi-truck’s cab. I slept in a van in a Chicago Heights cow field for a week before getting a bunkhouse room with a missing door and window. In Northern California, I slept in bunkhouses with bed bugs and fought off the creatures for the better part of two months. During my hitchhiking between carnival shows, I stayed in homeless shelters in Anchorage, Memphis and St. Paul. I need deposit money and a job for an apartment. Jobs don’t like references from carnivals. How am I going to find a home after this, I whined to Tyrone, who worked the Mardi Gras house with me during the fair. Then on that November morn, Tyrone won the award for the kindest and scariest words of my year in traveling carnivals. You can be with us, he meant, for the rest of your life. On this New Year’s Day, I can finally reply, maybe when the saints go marching in. I’ve spent the year with eight traveling carnival troops, hitchhiking between jumps across America. I’ve traveled 36 states, 20,000 miles crisscrossing the US, Canada and Mexico. My year ends in February. Free! Free! Free! Click right here and see it all. Never before seen video of the West Crew in Minnesota, in Oklahoma, in Texas state fairs. 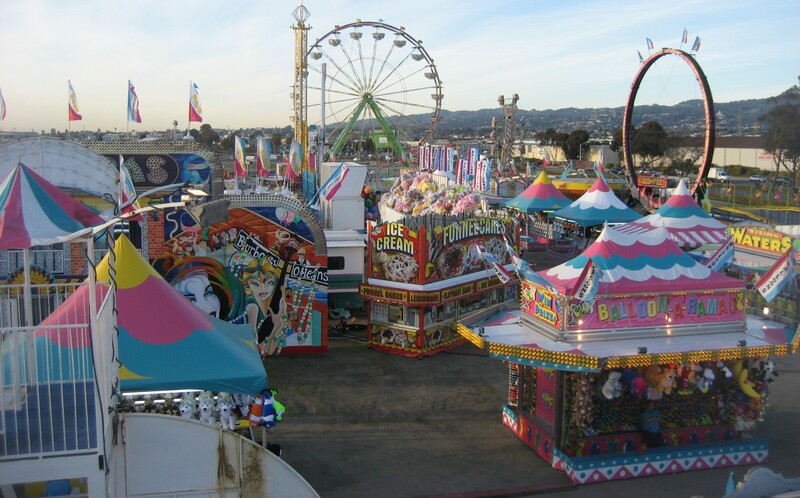 Biggest carnivals in USA. Be astounded at my juggling. Be mesmerized by my bally. See the Wild, Wild West Crew for Free! Free! Free! (September, October with Adam West’s Allstate 38. We ran games. Patrick White died suddenly in Texas. Didn’t know I had enough film for a video but know Poynter Institute will be asking for my video training certificate back. Bit jumpy, I blame it on Windows 8 Movie Maker. Light up the sky, kiss the girls and jig till I trip and laugh. All I did was take this video. The backstory is long but I’ll give you the short version. I quit a Hudson River Valley carnival that May morning on my way to Chicago for my daughter’s 8th birthday. The trip wasn’t planned. My daughter’s birthday was on the line. Only the Taconic State Parkway and local roads to hitch before the interstate. Not good. It was a snap judgment to quit and hit the road. All day I’d be stopped by state and local cops. In one two hour span, six cops stopped me. When three cops in three squads pulled up, I was both afraid and amused. The cops suggested I return to New York City or walk out of the state, to Pennsylvania. When they left, I wrote on a cardboard sign “84 West,” put it on my back and kept walking west. No thumb out but drivers knew the score. I was in bad shape just moments before this video. Miles of walking and then up fast pulled a pick-up truck with a young father, his son and the family dog. Dad told me to hop in the flatbed. The son looked at me like a work of fiction, or history. About the same age as my daughter, he seemed more confused than the dog. I threw my packs in the back and that pick-up truck peeled away from the curb. Down the on-ramp for I-84, we sped past other cars. Making time. Free from the cops. Jig? Nooo! What the video won’t show is what happened before and after, that you’ll have to imagine. What it shows is 17 seconds of bumpy, windy ride. What you hear is a hitchhiker shouting coordinates. Watch it closely now and know the cargo is alive again and feels swear-at-the-sky joy. My change of luck happens off camera but it is felt as I speed into the coming nightfall. Still, I’ve long known happiness appears in moments, often short unexpected bursts, if only for 17 seconds. I’m in the tenth month of my year working in traveling carnivals and hitchhiking between jumps. I’ve worked with eight carnival companies and hitched 13,500 miles across 26 US states and western Canada. Including travel to Mexico and 36 states in all, I’ve logged more than 20,000 miles. I’m now writing book proposals and looking for agents. I may work more carnivals before I’m finished. Osvaldo Guzman picked up this hitchhiker near Alligator Alley in Florida after I had spent a few days sleep deprived, sick with the flu and all day without food or water. In a thick Cuban accent, he said he knows the look and then this. He tells of loosing seven people on a raft from Cuba and after this clip tells me he saw the same look on my face beside the road (he was 10 days on the water on last of three trips). Now he’s legal. He owns a heating and air-conditioning business and an Amway distributorship. He gave me Amway vitamins and an energy drink and left me at an Alligator Alley rest stop on the side of the road. He had gone out of his way because he then turned around and headed back east. But not without honking his horn and a thumbs up. Shoes with holes. Broke. Hitchhiking. Fifty-four years old. No girlfriend. No home. No prospects for a book. Thank God I’m not weeping (which come to think about it would have made a much, much better video).